Join us this week as we welcome country music singer songwriter, Trent Tomlinson. Making his entry in the country music scene Tomlinson released his debut album COUNTRY IS MY ROCK in early 2006. The project produced three Top 40 singles on the US Billboard Hot Country Songs chart: “Drunker Than Me” at No. 19, “One Wing In The Fire” at No. 11 and “Just Might Have Her Radio On” at No. 21. While he may have temporarily stepped away from the recording studio, fellow award-winning entertainers proudly and steadily aligned with his talents as a sought-after song-crafter establishing Tomlinson as a “go to” hit maker. Trent now celebrates his return to the country music spotlight with his new single, “Come Back To Bed.” The track (co-written by Tomlinson, Ashe Underwood and Terri Jo Box) reveals a slight departure from the notorious party anthems, rough and ruckus storylines and “bad boy” image Tomlinson has been characterized by as this tune subtly introduces a more mature and sensual side. The single arrives from Tomlinson’s third studio album [from the EP anticipated in late Fall 2014 (Guiseppe Records)]. The single is currently available via iTunes and all other major digital outlets. We will talk to Trent about his upcoming schedule, get a behind the scenes look at his music, feature his latest songs, and ask him to share his message for the troops. 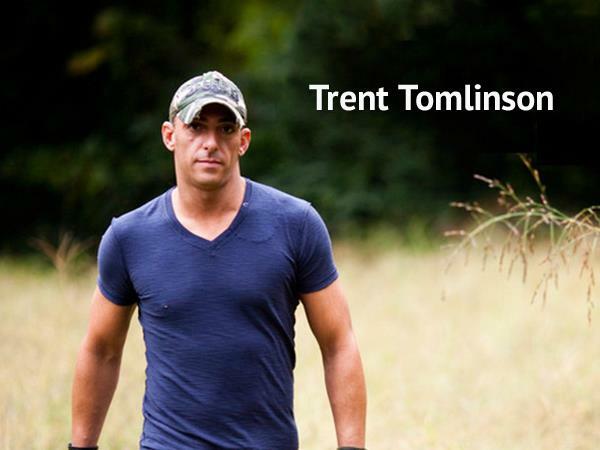 Please be sure to visit Trent Tomlinson at http://www.facebook.com/trenttomlinson and spread the word. Fans are welcome to call in and speak live with with Trent during the show (718) 766-4193. If you would like to participate in the live chat during the show, you must sign up on the show site first and then log in during the show. Our message to the troops....WE do what we do, because YOU do what you do.